We are open for school vacation week, Monday, April 15 through Friday, April 19, noon to 4 p.m. Thursday, April 18 from 12:00 - 3:30 pose with Peter Rabbit and take your picture home with you. Peter loves the Merry-Go-Round, he might even take a few spins! $4 for the picture. Springtime Door Décor Create A Colorful Spring Wreath to Greet your Family & Friends. Construct a Large Grapevine Wreath Decorated with Pots of Pretty Pansies. $35 Includes Supplies, Instruction & First Glass of Wine or Soft Drink Come Learn Something New & Enjoy Laughs with Friends! Call Now to Register 589-7071. Class Size Limited, Payment on Registration Required. Come down to the taproom from 6-8pm flex your creativity muscles with our resident artist for the month Scott Boilard! He will perform a live painting and if your feeling creative we highly encourage our guests to bring their own art supplies and create their own work of art! Come see the Eric Carle Makes a Book exhibition in your PJs, and don’t forget to bring along your favorite stuffed animal! In addition to bookmaking, storytime, films, and milk and cookies, guests can get drawings of their stuffed animal by local artists. Children must be accompanied by an adult. Reservations are recommended; call 413-559-6336. Free with Museum Admission. 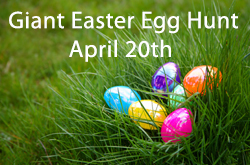 Peter Rabbit will be on hand Easter Sunday! He will be visiting with us from 12:00 - 3:30. Come in & say hello and don't forget to take a spin! !